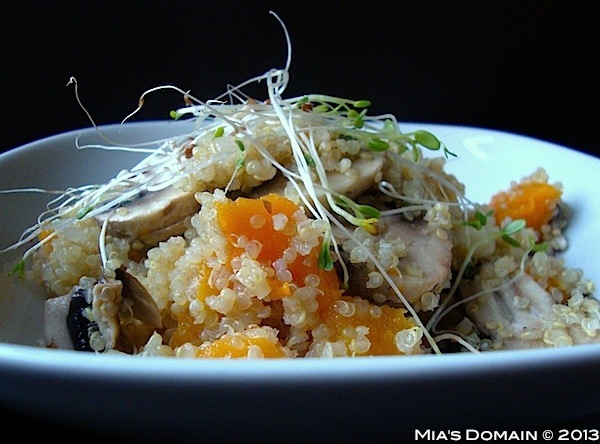 Mia's Domain: Happy Quinoa Year! The holiday season has left everyone with a lack of energy. Happy, but tired. Too much partying or just too much emotion? The good news is that this year has been declared the international year of quinoa by the FAO (Food and Agricultural Organization of the United Nations). This famous Peruvian superfood has the power to nurture us well into the new year. 2012 was a good year for Peruvian cuisine, it's starting to get the recognition it deserves. You see, we eat dishes that not only fill our bellies but also our soul. Like superheroes, these ingredients have special powers. Maca, the Andean root, gives you a boost of energy. 'Kausac', a potato dish, literally means 'life' - and that's what it gives us. Kiwicha's grain flies through space as part of NASA's astronaut menu. And this year Huayllabambana, a new Peruvian superhero, was discovered - this super seed can produce oil which is 66% Omega 3. Red, purple and gold carpets of quinoa flowers today drift happily from side to side high up in the Andes. Quinoa (pronounced keen-wa) was an Inca treasure. Each year the Incan emperor would ceremonially plant the first seeds of the season, digging into the soil with his golden spade. Quinoa was hugely valuable in the Inca trade system and during the solstice priests would offer vessels filled with quinoa to the ancient Inca sun God, Inti. The Spanish, unaware of it's rich properties, replaced it with other cereals in their diet. Despite that, Andean people have protected the tradition that surrounds this crop allowing present and future generations to enrich themselves with quinoa. So we're glad the Spanish didn't find the gold after all! Known as the 'mother grain' for its balanced nutritional value, it has a high quality protein, high fibre content, minerals and plenty of vitamins. If compared to other similar grains in its category, then quinoa wins hands down; its power is impressive. Take for example its iron content, it has twice the amount that beans have and three times more than rice. It's considered to be a gluten free cereal, so its flour is a perfect solution for coeliac diets.